Congrats to Sitka School District and Dr. Mary Wegner! 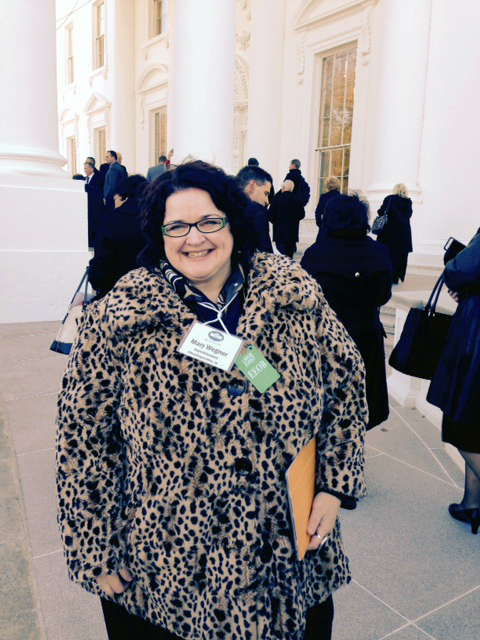 It is not every day that a local education leader from Alaska is honored at the White House! But Dr. Mary Wegner, superintendent of the Sitka School District, was selected by the U.S. Department of Education as one of 100 top school leaders nationwide to participate in the first-ever National ConnectED Superintendents Summit. The conference brought together school officials from across the country to share ideas on the best way to leverage technology in schools, and Dr. Wegner was recognized for her leadership in bringing digital learning to Sitka School District. This was no small feat. As President Obama said during the ConnectED Superintendents Summit, “The world’s information is just a click away, it demands we bring our schools and libraries into the 21st century.” Dr. Wegner did just that. Sitka School District had a very special set of challenges, including its remote location and lack of roads. The district had slow old wiring, no wireless network and only about 3 Mbps of bandwidth. When technology broke, it was rarely fixed. About 6 years ago, students approached the school board and said “you aren’t preparing us for our future.” A year later, Dr. Wegner was brought in and played a major role in revamping the school’s technology. “Bandwidth was the biggest barrier,” said Dr. Wegner. GCI brought in fiber and by working with GCI SchoolAccess, changes started to fall into place. The district now has high-speed internet and can leverage digital teaching tools. Dr. Wegner and the Sitka School District were able to accomplish exactly what the ConnectED summit is all about. “Kids who come from very, very little – if we can give them a chance in life through education, they can break through that. The divide between the haves and have nots can’t be around educational opportunity –it can’t be around access to technology – this has to be the way to level the playing field for everyone and drive excellence,” said Arne Duncan, Secretary of Education at the summit. Over the next 5 years, the plan for ConnectED is to close the technology gap and connect 99 percent of schools to high-speed broadband. Right now, less than 40 percent have access to high-speed internet. “In a country where we expect free Wi-Fi with our coffee, the least we can do is make sure our schools have access,” said President Obama. And he’s right, to prepare our children and ensure that the United States can compete at a global level, we must provide adequate access to everyone, regardless of geographic location. Thank you, Mary Wegner for doing your part to help empower students in Alaska!